Everyone knows about the horrors of Hiroshima but you can’t say you really understand it until you’ve been here and even then you’re unlikely to grasp the true horror that brought this city to the world’s attention at 8:15am on August 6th 1945. 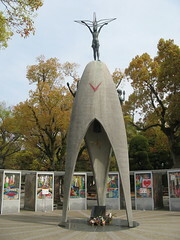 I walked through the Peace Park and read every display in the museum but how much can that really pass on? It was a pretty moving experience for sure. The first thing inside is a looping movie calling for total nuclear disarmament and a scale model of the city after the bomb. What surprised me was the amount of explanation for times before the bombing. Details of Japan’s ventures into mainland Asia including admitting that civilians in China were “being massacred”. And that goes to the heart of the peace museum. It’s not assigning blame to the U.S. or feeling sorry for Hiroshima but using its attention to call for world wide peace, cooperation and understanding. Pretty lofty goals but goals worth trying for. Every time a country tests a nuclear weapon the active mayor of Hiroshima has written to that government calling for a cessation of development. It is still falling on deaf ears but they continue their struggle. When the display deals with the Allied Forces decision to bomb it unveiled some details I didn’t know about why Hiroshima was chosen and why the bombs here and at Nagasaki were used at all. Upstairs was the aftermath. Pictures taken as the mushroom cloud rose higher and then to the victims and the repair job. It’s fair to say that it was a sombre morning. Outside in the sunshine we ate lunch a few hundred metres below the hypocenter. Children chased pigeons and pigeons chased each other. Where once it was said nothing would grow for 75 years, a new city has grown and is as healthy and vibrant as any. Tonight is my last in a hostel for a while. Tomorrow I head for the cape with my bag and everything I need for 5 months. Except for food. I haven’t had much luck finding the foods I wanted so I’ll buy on the road and be glad that I’m not carrying 6 days of food at a time. Lorraine and I have been looking for tempura places all week and finally found one tonight. 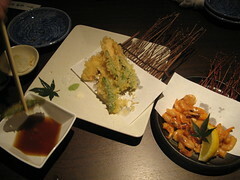 Though I successfully managed to order vegetarian tempura I then couldn’t order a meat-based version for me so I settled for fried shrimp that turned out to include shells and heads. I haven’t been able to get a phone here without my foreigner registration card which hopefully is waiting for me in Nagano. This means blog posts and emails will build up until I hit a WiFi area. Don’t be alarmed if you don’t hear from me for a week or more. I now walk into the wild. 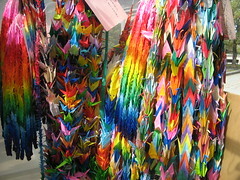 You will never forget Hiroshima. And, until we meet again.